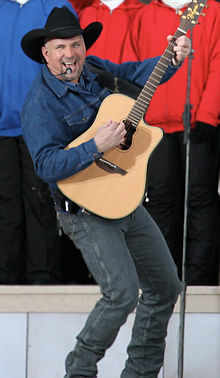 Troyal Garth Brooks (born February 7 1962) is an American country music singer and songwriter. All songs written by Garth Brooks, except as noted. Not counting you I've never had a heartache. Not counting you I never have been blue. I've never been nobody's fool. I've never lost at love not counting you. Gonna be enough to last? If Tomorrow Never Comes, written by G. Brooks and Kent Blazy. And the white line's getting longer and the saddle's getting cold. I'm much too young to feel this damn old. And the beer chases my blues away. Think I'll slip on down to the oasis. Oh, I've got friends in low places. Friends in Low Places, written by DeWayne Blackwell and Earl "Bud" Lee. Sometimes I thank God for unanswered prayers. That just because he doesn't answer doesn't mean he don't care. Unanswered Prayers, written by Pat Alger, Larry Bastian, and G. Brooks. It's the roar of a Sunday crowd. He'll win the next go 'round. And they call the thing rodeo. Rodeo, written by Larry Bastian. Fillin' up my mind and emptyin' my heart. And I wonder if she knows...what she's doin' now. What She's Doing Now, written by Pat Alger and G. Brooks. Papa Loved Mama, written by Kim Williams and G. Brooks. Ever changin' as it flows. That must follow where it goes. 'Til the river runs dry. These waters are my sky. The River, written by Victoria Shaw and G. Brooks. Then we shall be free. We Shall Be Free, written by Stephanie Davis and G. Brooks. She needs to hear I love you. She needs to know you care. Somewhere other than the night. Somewhere Other Than the Night, written by Kent Blazy and G. Brooks. Written in her lover's eyes. Burning both ends of the night. That Summer, written by Pat Alger, Sandy Mahl-Brooks, and G. Brooks. If you're standing outside the fire. Standing Outside the Fire, written by Jenny Yates and G. Brooks. Ain't givin' in 'til they get enough. Ain't goin' down 'til the sun comes up. Ain't Goin' Down, written by Kent Blazy, Kim Williams, and G. Brooks. Two shadows starting to softly combine. It's a true work of art. Thundering moments of tenderness rage. Burning the night like the dawn. The Red Strokes, written by Jim Garver, Lisa Sanderson, Jenny Yates, and G. Brooks. They said good-bye at the break of dawn. Then someday he'll find his way back to her arms. That Ol' Wind, written by Leigh Reynolds and G. Brooks. And drew a bull no man could ride. Well it turned out that he lied. Died right there beside him in Cheyenne. The Beaches of Cheyenne, written by Dan Roberts, Bryan Kennedy, and G. Brooks. There's gonna be some changes in the way this story goes. And the party's just begun. It's Midnight Cinderella, written by Kim Williams, Kent Blazy, and G. Brooks. Oh but even at her worst it ain't that bad. Lord she's every lover that I've ever had. And she's every lover that I've never had. She's Every Woman, written by Victoria Shaw and G. Brooks. It's clear that there's no doubt. And she's over that hill. And her sails are filled. She's Gonna Make It, written by Kent Blazy, Kim Williams, and G. Brooks. This picture perfect portrait that they paint of me. In Another's Eyes, written by Bobby Wood, John Peppard, and G. Brooks, duet with Trisha Yearwood. Is what is killing me. For that river of red could be the death of me. That blood is thicker than water. Oh, but love is thicker than blood. Of something that means so much more. Thicker Than Blood, written by Jenny Yates and G. Brooks. And it keeps me hanging on. 'Till we reach the circle's end. When you come back to me again. When You Come Back to Me Again, written by Jenny Yates and G. Brooks. This page was last edited on 26 August 2018, at 16:00.